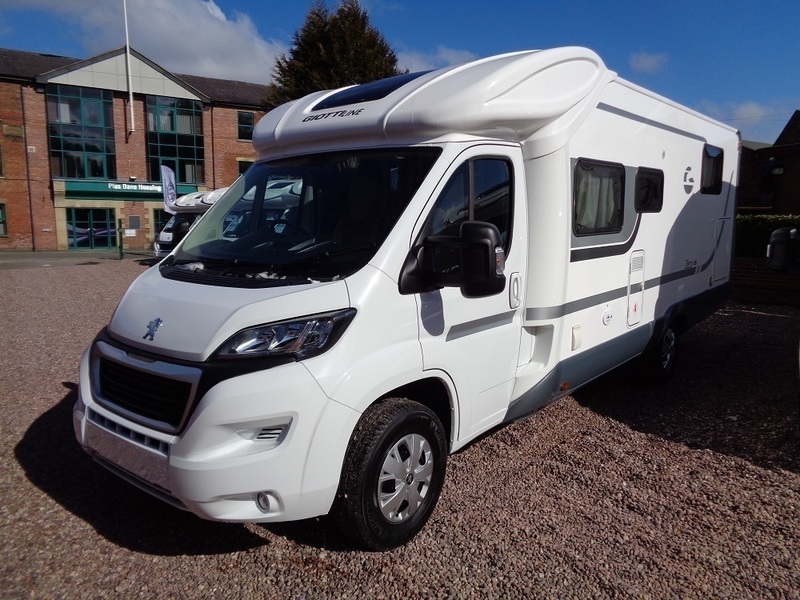 The GiottiLine T38 is a New 2018 comfortable Motorhome built on a Peugeot Chassis and manual Gearbox with all the luxury facilities. 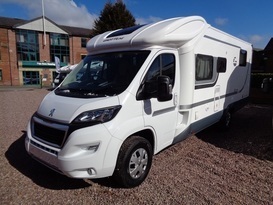 It is a 5 Berth and Traveling Motorhome and is ideal for a family holiday or even with friends. The GiottiLine T38 Motorhome is manufactured in the Tuscany region of Italy and has all that you need for a great holiday in the UK or abroad! At the rear of the Motorhome is the bedroom with a double island bed, 21" television and ample storage space, there is an electric drop down double bed above the dining area and and the dining area can be converted into another additional bed. There is a fully equipped kitchen with fridge freezer , 3 burner gas hob, Microwave and a separate oven. There is a comfortable seating area with a 24" freeview television. Externally there is a fiamma wind out sun awning, a Portable Gas BBQ for alfresco dining, a large garage at the rear and a dual reversing camera fitted for safety. A gasflow system is fitted for easy refill with adaptors for refill in most European Countries . Price includes CDW . Note there is a £10 nightly supplement for Ireland and European travel. A full inventory is included in the hire price and we can offer optional extras if required these include Bedding packs, Electric folding Mantis E-bikes, petrol generators, Bike racks and much more. 5 Motorhome Pitches, set in Stunning Astbury, Cheshire. Hirer must empty all waste before returning.